My wife has a lot of books. We have a whole room in our house dedicated to storing them. We call it the library, because we’re snooty like that. Some of the other rooms of our house have dedicated shelves for specific kinds of books. In the kitchen, we keep cookbooks in a cupboard above our microwave, but that cupboard is now so full that we can’t add any more books to it. 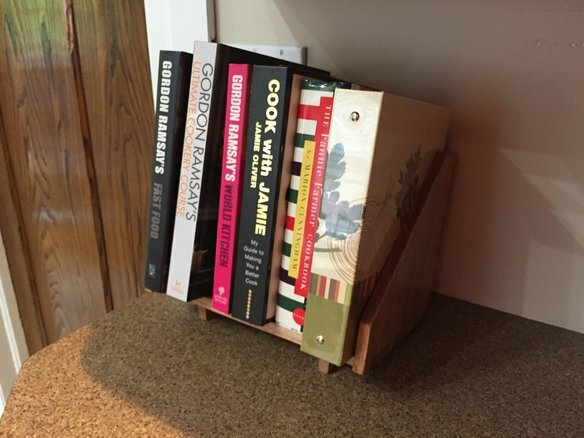 To rectify the situation, my wife asked me to build her a counter top sized bookshelf that could accommodate her favourite cookbooks, so that they were out and easy to access, and more cupboard space was made available for the inevitable purchase of additional books. The plan was pretty simple. 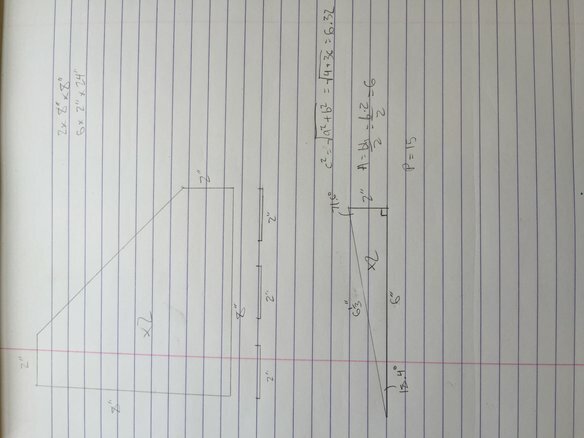 I’d build two triangle-ish end pieces, with slats joining them together. The whole construction would be angled backward at about 15 degrees, tilting the spines of the books up towards anybody who might be looking at the shelf. I started with a 1″ x 6″ x 6′ piece of poplar from the Home Depot, which was actually 3/4″ x 5 1/2″ x 6′ long. Before I did anything else, I jointed and planed this piece to ensure that it was square, and milled it to a final thickness of 1/2″. 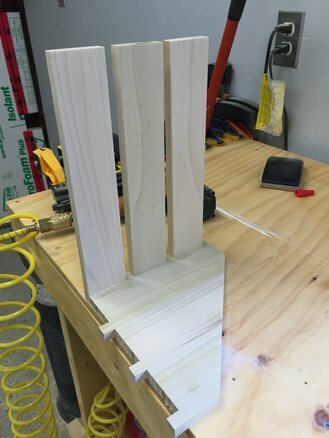 Since I wanted the end pieces of the shelf to be approximately 8″ x 8″ along their non-hypotenuse sides, the first job was to cut four 5 1/2″ x 9″ pieces from the poplar, and joint them together to form two 11″ x 9″ boards. These would later be cut down to the appropriate sizes to form the ends of the shelf. With the glue dried, I cut the end pieces to size, and then mocked up a simple jig on my crosscut sled that allowed me to cut the angle bit that turned the end pieces from rectangles into sort-of-triangles. Once the final size of the shelf ends was established, I could work on the joinery for the slats that would hold them together. 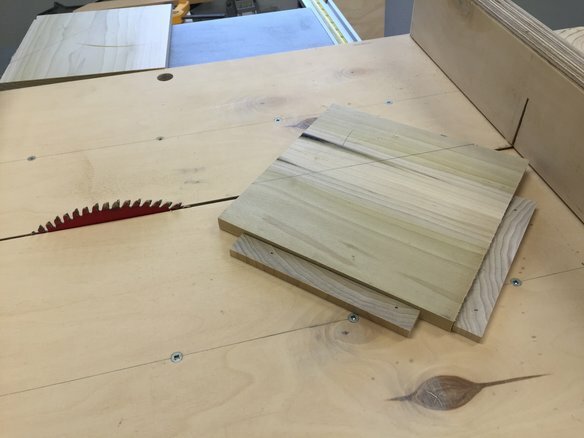 I settled on 2″ by 1/2″ slats, each around 13″ long, which would give me a final interior shelf length of approximately 12″. I used my box joint blade to cut three slots along each of the straight edges for the slats to fit into. 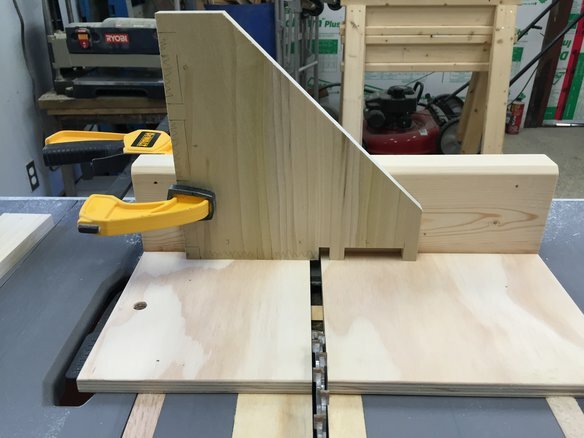 The trick with this approach is to cut each slot just a little bit small, and then to sneak up on the final dimensions, fine tuning where necessary with a file and sand paper to achieve a tight joint. Thankfully, I didn’t screw anything up, and because my slats had been milled to a uniform size, they were all interchangeable. 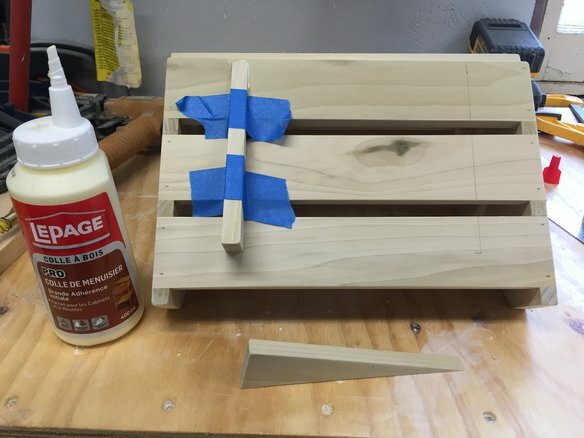 With the slots cut out of both ends, I started to attach the slats, using glue and 3/4″ brad nails to tack it all together while the glue dried. 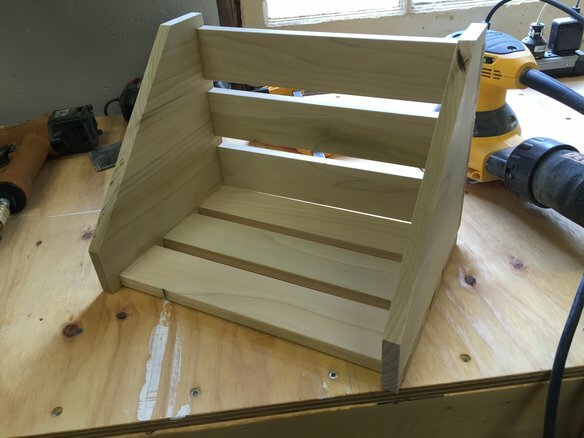 With all of the slats attached, the shelf really started to take shape. Next, I needed to cut some triangle pieces that would act as feet for the shelf, tipping it backward so that the spines of the cookbooks were angled up toward the viewer. 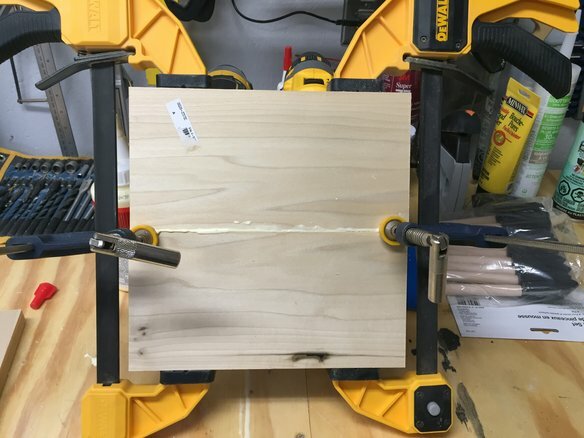 Since I needed them to be the same, I got smart and taped two pieces of scrap poplar together, then marked out the desired shape and ran them both through the table in a single pass. 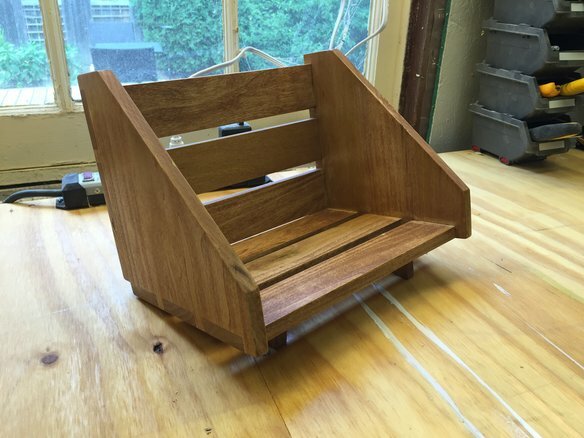 Once cut, I glued the feet to the bottom of the shelf, and tacked them in place with brad nails from the other side. This required some temporary tape to hold the feet in place while I flipped the piece over and fired the brad nails. I swear, I’m constantly finding more uses for that blue painters’ tape. It’s great stuff to have around. 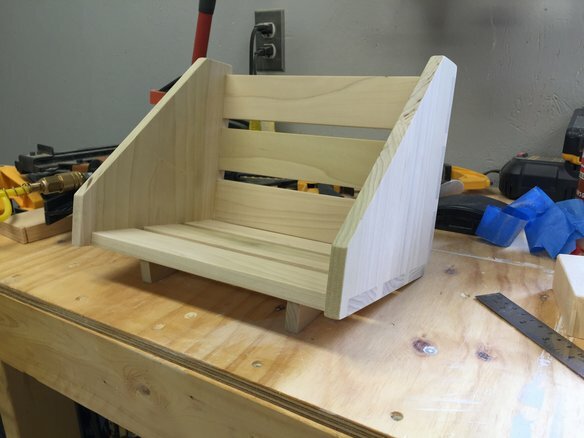 With the legs attached, the shelf really looked great. I gave the whole thing a good final sanding down to 220 grit in preparation for finish. The finish consists of a single coat of brown stain that I had left over from a previous project, followed by a coat of wipe on polyurethane. Both coats were applied by hand with an old rag, and between coats, I sanded with 400 grit sand paper, as well as 000 steel wool. After letting the finish cure on the bench for a couple of days, I brought the shelf inside, and Steph loaded it up with her favourite cookbooks. I’d say that it turned out pretty well.